Attention! Mysterious unknown dish was spotted in the Serbian forest! 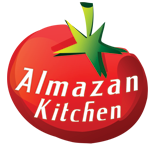 In the closer look our correspondents can verify that it is an amazing popular Japanese street-food dish called “Okonomiyaki” made in the way of AlmazanKitchen! That is a new sensation! You don’t want to miss these forest made pancakes with dry-aged ham, fried egg, greens and veggies under all kind of sauces! Warning, our videos can cause addiction! Slice and chop 300g of dry-aged ham, handful of cabbage, young silver onion, dill and mozzarella. Mix 1 tsp. of soda, salt, water from mozzarella 1 egg with 2 hands of flour. Finger it well until batter consistency! Add more water if needed. Preheat special clayware stove plate and grease it with oil. Bake a pancake using batter add cabbage, mozzarella halfway. While step #4 is in process fry 1 egg and dry-aged ham. Place fried dry-aged ham on the pancake, flip it and place on fried egg. Pour well with yakitori sauce and homemade mayo. Finish off with chopped young silver onions and dill.